Architecture is concealing a great problem. When design and architecture magazine Icon decided to put the UK’s social housing issues under fire, it called Ray Oranges to inspire the new breed of architects. 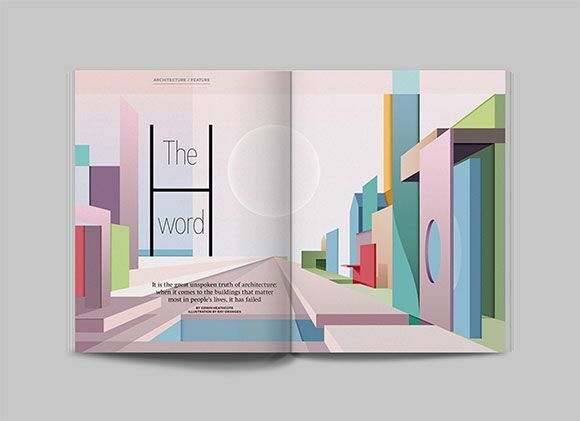 What better way to translate the utopia captured by Icon’s leading feature than through Ray’s visionary compositions? Space to dream is a recurrent theme in Ray’s artwork. For this issue of Icon, Ray’s work narrates the story of a vibrant future that architecture has the potential to achieve. Leading the way with his bright graphics and simple, well chosen details Ray’s illustrations bring the promise of tomorrow. His decluttered structures leave room for the imagination to take flight. Light and shadow exist in juxtaposed play, working in tandem to create a compelling absence that narrates a bold presence. His vast urbanscapes call the minds and abilities of architects everywhere to visualise ambitious concepts and palpably act upon ideological aims. Capturing the futuristic foundations of chimeric yet functional housing is a challenging balance. Using a jewell palette of jade green, turquoise, ochre and coral to offset hues that mirror a pastel sunrise, the weight of reality is lifted by optimism. With Ray’s insightful vision of voluminous walkways, floating houses and streets in the air he spins a sense of collective hope. Icon and Ray were destined to slot together. His background in product development and studies in Architecture enable Ray to marry aesthetic appeal with an innate understanding of responsible design. For this feature, the argument goes that architects must reconsider their working practise and take the reigns to positively launch tomorrows social effectivity. 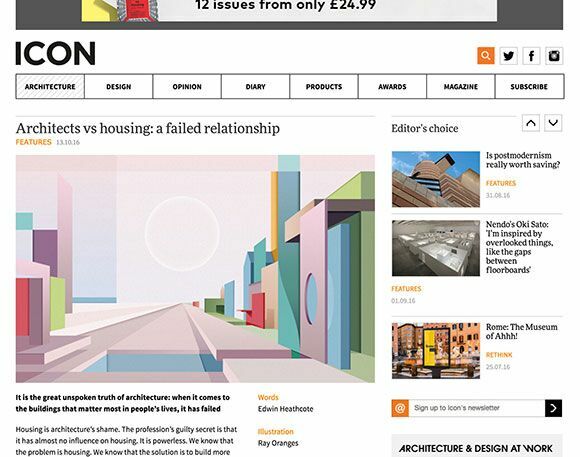 Icon’s article examines how the discipline once constructed buildings made to matter in people’s lives and argues that today’s urban infrastructure instead centres around luxury apartments and capital gain. In Ray’s seamless integration of Utopian belief with systematic contours the spirit of architectural optimism well and truly lives on.